We “had you at ‘hello,’” didn’t we? Thought so. 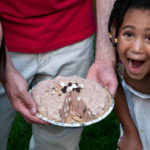 Kids and adults alike go ga-ga for this pie, and it’s the perfect end to an outdoor barbecue. Stacey’s family has had this recipe for years, ever since her mom cut it out of a Sunday circular with a coupon for what we can only guess was a Kraft Foods product, seeing as the main ingredients are Cool Whip and Jell-O instant pudding mix. Pour 1½ cups half-and-half into a bowl and add 1 four-serving package of Jell-O Chocolate Instant Pudding Mix. Whisk to combine thoroughly. Fold in eight ounces of thawed Cool Whip (the real stuff!) 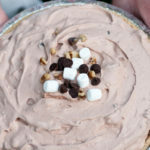 and the following add-ins: 1/3 cup chocolate chips, 1/3 cup mini marshmallows, 1/3 cup walnuts. Spoon into a graham cracker pie crust and freeze at least six hours, until firm. Remove from freezer for a few minutes before cutting and serving. Kraft is known for these types of simple yet tasty recipes, and their coupons make it all too easy to add their items into your shopping cart. We prefer to emphasize enjoyment of whole foods, but since we do believe in balance, we always find room for dessert, too. Some foodies may dismiss Kraft and their recipes, but our interest is including all sorts of tastes, recipes, and ideas that pique our interest. Besides, with the holiday weekend approaching, it’s helpful to have another simple recipe on hand. 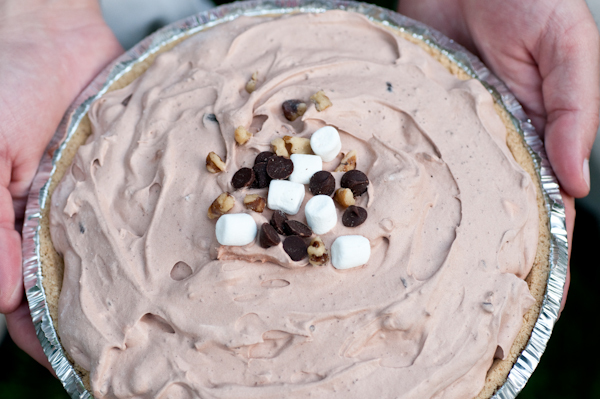 What’s your go-to summer cookout dessert? Please share your family’s favorites! This looks absolutely stunning! I love chocolate and love cold puddings.